We carry this precious Message around in the unadorned clay pots of our ordinary lives. That's to prevent anyone from confusing God's incomparable power with us. I listened as she shared her heart with me. She told me how she felt like a fraud – being looked to as a leader in the church when her own life was so out of whack. I listened and I remembered feeling like that several times myself. I felt hollow and like I was just going through the motions - singing on the worship team while struggling to find a song of praise in my heart of hearts, ever the encourager even as I waged my own battle with despair, speaking faith and feeling fear… I could go on. To be completely honest, I still feel this way sometimes – unworthy and ineffective. Here’s the crazy part though. How about it is during those very times that someone comes and tells me how something I said when I thought I was “just talking” or something I did was just what they needed. It amazes me every time to think that God chooses to used a cracked pot like me (please note I did NOT say a “crackpot” as that is an entirely different post! ). So as I listened to my dear friend I also listened to God for what, if anything, I should say. I thought about the people who made an impact in my life over the years - and the ones who didn’t. The “perfect” people didn’t reach me. I couldn’t relate to them because I was nowhere near where they were (and probably never would be!). It is the ‘cracked pots,’ the ones who weathered storms, made mistakes (sometimes BIG ones), and kept moving forward in their faith anyway that gave me hope and encouragement. Our shortcomings, struggles, doubts and questions don’t make us frauds, they make us human. They come with the territory, and they don’t take God by surprise at all. The potter knows exactly what kind of pots He created and how He intended for them to function together for His glory. To the human eye they may seem useless or dysfunctional, but when the time comes for Him to use them, He seals each and every crack with His precious Holy Spirit and they function perfectly. How awesome is that?! 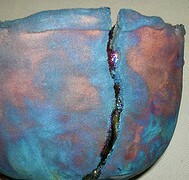 I would rather be a cracked pot in the hands of the Master than a perfect vessel any day, wouldn’t you? Have a blessed one beloved.